Muffin Top Bye-Bye–Summer Cleanse Starts Sunday! Summer is here and that muffin top needs to go! We want to look in the mirror and like what we see. We want to go bathing suit shopping in celebration, not in fear or shame. And, we are not competing with Sports Illustrated supermodels. Every shape, every body type is beautiful. What is important is that we like the skin we’re in–that we are our healthiest, most vibrant selves. If you have been struggling with chronic yeast or bladder infections, allergies or a slow metabolism, this cleanse is for you. If it has been a long time since you had kid-level energy, glowing skin and crystal clear thinking, jump in to the Happy-Gut Makeover, and discover how fabulous you can feel. Dump the Blah, the Bloat, and the Muffin Top! Our bodies talk to us, and they tell us the truth. When we are feeling slow, heavy, foggy, and blah when we get up in the morning, that means something. It is a sign that toxins and processed foods are clogging up the gut and brain. As we learned last week in my blog about superbugs, we also know that toxicity is a danger to our immune systems. But, as you frown over that muffin top, the strength of your immune system may not be the first thing on your mind. And that’s OK! How we feel about our bodies is a big part of self esteem. Many of my clients showed up only to lose ten or twenty pounds, so that they could slither into a pair of hot jeans, only to discover the real gold was their new-found radiance, mental sharpness and steady, happy mood. Happiness begins with a healthy gut, and this cleanse will give you all the tools you need to makeover yours. Join Us this Sunday for the Happy-Gut Makeover Body Cleanse! Join us this Sunday for the one week mini-Makeover, or the whole six week Happy-Gut Makeover Cleanse! Make this the summer that changes your life! Whether you are struggling with a junk food obsession, want to shrink that muffin top, start to eat clean, and just want the support to continue your journey, this group promises to be fun, friendly and a fast-track to a body you love. 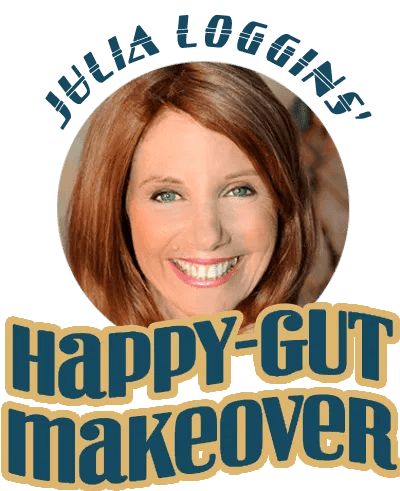 Join Our Happy Gut Makeover, June 12-17! Cleanse your body. Lose unwanted pounds. Get in shape before summer! This is the perfect time of year to boost your energy, in the company of wonderful, supportive new friends! I continue recovering from surgery. I am using natural pain relief and immune support! I will share always what I learn with you! I am super excited to tell you that BOTH my books are now available in audio form. Find them on my website for download, and will soon be available on ITunes and Amazon Audible. Enjoy! After a successful run of the audio version of my first book, Dare to Detoxify! my clients convinced me to record my new book, It Takes Guts To Be Happy! They love listening as well as reading. I hope you do, too!